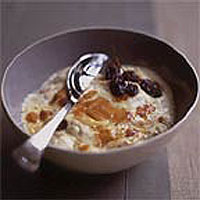 "I am not suggesting that the basic, plain version of rice pudding is in any way deficient," says Nigella, "but this muskily ambrosial version is mellow heaven. Perfect dinner-party comfort food." Combine the milk and cream. In a 1.5-litre, hob-proof casserole dish, melt the butter over a medium-low heat, add the rice and stir well to coat, then add the muscat. Stir well and let the syrupy liquid bubble away for a couple of minutes. Then pour in the milk and cream and add the sugar and salt, stirring as you do so. Bring it back to a gentle bubble, stir well again and grate over some fresh nutmeg. Put in the oven and cook for 2 hours, stirring after the first 30 minutes. Check the dish after 1½ hours - the depth of the dish and the nature of your oven may make a significant difference. The rice should have absorbed the liquid, but still be voluptuously creamy. Remove and cool for at least half an hour before eating.